In the 12th century, the castle was built by a minstrel knight, a relative of the Count´s of Riedenburg. The minstrel did not only court beautiful ladies, he also practised the art of falconry. Today the falconers on Rosenburg uphold this tradition. For this purpose falcons, eagles, vultures and other indigenous birds of prey are kept on the castle, birds which have been extinct in the region for a long time. The flying show is a special attraction for visitors. 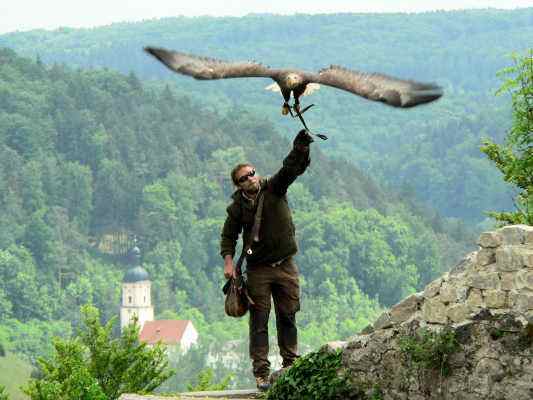 The situation of the castle on a steep hill and the deep valleys around Riedenburg are exactly suitable for flying birds of prey. In the updraught of warm air at the hillside, they soar up to 3.000 feet, and there they hover in eager expectation of the falconer´s call. Then they rush down headlong to the food on the falconer´s gauntlet. The visual power of birds of prey is 20 times the power of man. Training the birds for such a show means a lot of work and patience. For about three months a bird must be trained at least one hour a day. The stock consists of golden eagle , imperial eagle , bearded vulture, white-tailed eagle , white-headed eagle, hawk , common buzzard , honey-buzzard, sparrow hawk, eagle-owl , wood owl, snow-owl , barn-owl, tawny owl, game-hawk, passenger falcon, krestel.